MIPALLOY AIMS TO PROVIDE RIGHT QUALITY PRODUCT & SERVICES WITHIN COMMITTED SCHEDULES TO SATISFY THE ENTIRE NEEDS & EXPECTATIONS OF OUR VALUED CUSTOMERS. MIPALLOY WILL EMPLOY CONTINUOUS IMPROVEMENT POLICY TO ASSURE ALL THE ASPIRATIONS OF OUR CUSTOMERS IN TERMS OF QUALITY, PRICE, DELIVERYARE MET IN EVERY SPHERE OF ACTIVITY. 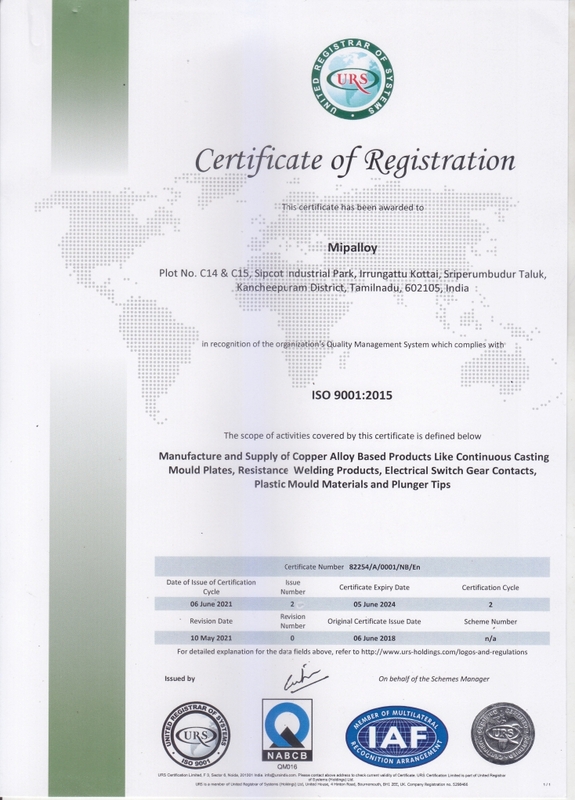 Mipalloy is Certified ISO 9001:2015 for Quality Management System. Mipalloy is Certified ISO 14001:2015 for Environmental Management System. Mipalloy is Certified ISO 18001:2007 for Health & Safety Management System. Our mission is to be the best in the world at what we do and have fun doing it. Mipalloy's talented and dedicated people, working as a team with aim to achieve 100 percent customer satisfaction by providing products of superior quality and reliability. In an increasingly competitive global economy, the companies that endure will have met the challenge of changing technologies. At Mipalloy, we have met-and will continue to meet-these challenges with substantial investments in skilled workers and state-of-the-art equipment. At Mipalloy, we have the capability and flexibility to meet your unique product requirements. From designing to formulating specialty alloys & mipalloy will work with customers to produce materials of exacting specifications. Our customer-oriented philosophy had always been kept us as the leader in the industry. Mipalloy sells its products direct from factory to original equipment manufacturers & customers. Also mipalloy has a nationwide network to give always a better service to our Customers. Also for our international customers we export a variety of products on a direct basis or through exclusive agents. Mipalloy is having three modern manufacturing units in the outskirts of Chennai, India with State of Art Manufacturing operations necessary to manufacture various products including Casting, Forging, Rolling, Heat Treatment, Special purpose Machining, CNC Machining, Gun drilling, Plating etc & Mipalloy is possessing all inspection equipments necessary to ensure our products are manufactured under strictly defined quality parameters. Our inspection capability include 3D FLEXIBLE GAGE. Also we can offer our producs with third party inspection agencies like Lloyds, Bureau Viretas or any other third party inspection agencies. Raw materials are procured from prime manufacturers with test certificate. All items are inspected by our quality assurance personnel for the required parameters. Raw materials after inspection are brought in to our production. All processing is done on Quality passed raw materials. After processing, samples are drawn & sent to testing laboratory for chemical analysis. Also samples are also metallurgically tested in approved metallurgical laboratory for analysis of microstructure. Quality materials within the parameters/standards are sent for further processing. Materials after processing are checked for physical properties (hardness, electrical conductivity etc). Approved materials are sent to tool room for further machining. Line inspection is done during machining to avoid any rejections while processing. Finished materials are sent for final inspection before despatch. Physical & dimensional tests are carried out in final inspection & approved materials are despatched to respective customers. Special care is taken while packing & proper identification is given for materials before despatch to ensure materials reaches our customers without any damage & with test certificates ready to use. These are the prime goals of Mipalloy to serve the industry better every day.